We had already seen so much in one day, but even though it was late, Dewa wanted to make one more stop on the way back to Ubud. He took us to the town of Klungkung - a "real" town, as Justine said, with shops and parks and traffic. 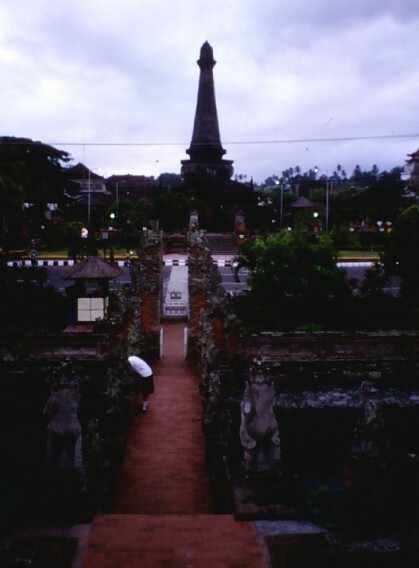 It's a regional capital and was once home to Bali's royal families. 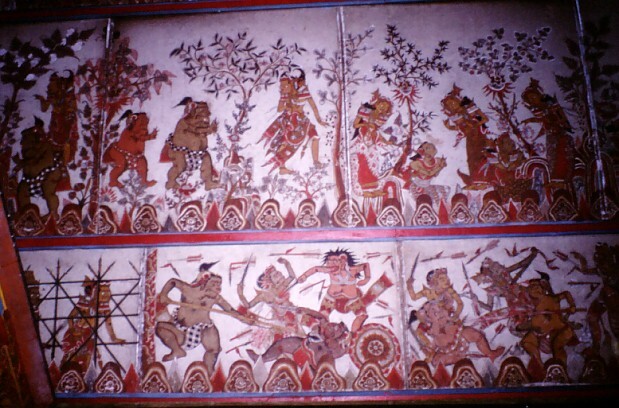 The thing to see in Klungkung is the Kertha Gosa pavilion with its famous ceilings painted with scenes from the Bhima Swarga story. 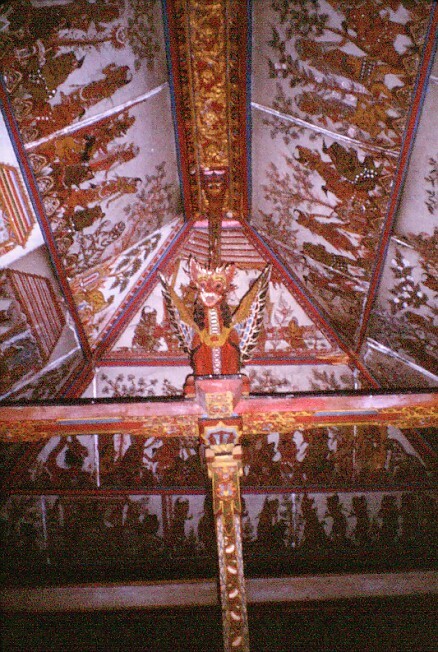 The Kertha Gosa was once the most important bale of the royal palace at Klungkung, and it was here that the raja and his judges would sit and discuss matters of law and human affairs. At some point it was decided that the story of Bhima Swarga, with its moralistic undertones, would be an appropriate decoration for such a high bale. Not all of them, though. 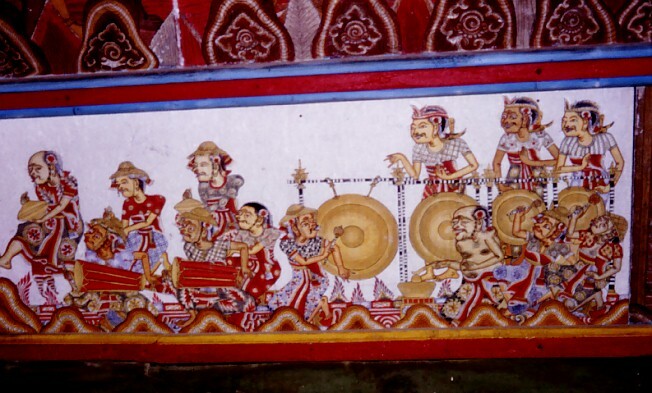 We really liked this one showing a gamelan orchestra, with gongs, two drummers, and a timekeeper. Accompanying Bhima on his journey are the two ubiquitous servants, Twalen and Mredah, who feature in many of the stories of the Mahabharata. Although these two are earthy clown characters, they actually show great wisdom, and are in a way the true heroes of the story. Acting as intermediaries, they interpret the story to the common Balinese people, and are the characters with whom the audience most identify. Twalen, the wise clown, is the mascot of our gamelan in Santa Cruz, and is often depicted on our concert flyers and programs. Outside the pavilion is a set of moats and walls. Dan is examining the contents of one of the moats. This looks like another battle shaping up. Even though Bhima has reached Heaven, he still has to do battle. 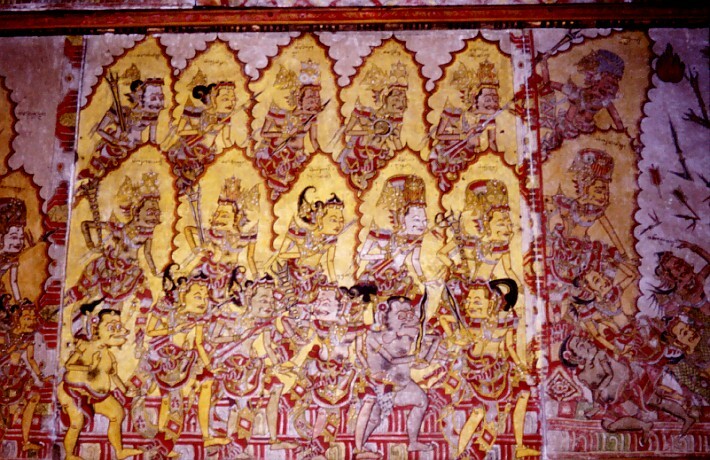 But here, he and his followers are depicted as being surrounded by magical energy or sakti, and the gods, although armed and evidently battling against him, do not attack him directly, suggesting that in Heaven, war is more psychological and spiritual, rather than physical and confrontational. There's an excellent book from which I took some of these notes, called "Bhima Swarga - The Balinese Journey of the Soul", by Idanna Pucci (Bulfinch Press), that tells the whole story of the Bhima Swarga, complete with lots of photos from the Kerta Gosa pavilion.